Our third grade worksheets help your students learn key third grade skills with fun exercises and beautiful illustrations. If your students need math practice, try our multiplication, decimals, money or division exercises. In reading and writing, we cover important topics such as irregular verbs and descriptive adjectives. 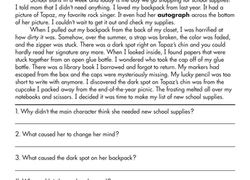 To try some material in the next level, check out our fourth grade worksheets. In this color by number, kids practice their times tables as they color the cake. Start your child on multiplication by practicing adding groups of a certain number using flowers to help. Third grade represents an important year for kids as they stand on the cusp between the early educational years and the significant shift that takes place in fourth grade curriculum. As kids transition to more complex tasks and independent thinking, it’s important to make sure they have the tools necessary to take on the increasingly challenging workload. Our third grade worksheets collection provides thousands of resources and opportunities to brush up on basics, get essential skills practice, and fill your child’s educational tool kit. There’s an engaging worksheet to target any area in which your child may need either extra support or a little push beyond their comfort zone. Our math and science worksheets cover everything from multiplication, fractions, and three-digit subtraction to planetary science, erosion, and ecosystems. Or help your child improve their writing and get the most out of their reading with fiction comprehension activities, writing prompts across multiple genres, and essential grammar practice. Go beyond the basics with our social emotional learning, social studies, or fine arts worksheets, and bring it all together to keep your child engaged, well-rounded, and eager to learn more.